From 11-20 July 2016 in Foz do Iguacu, Brazil, a training course was held on “Application of Satellite Remote Sensing to Support Water Resources Management in Latin America and the Caribbean”. 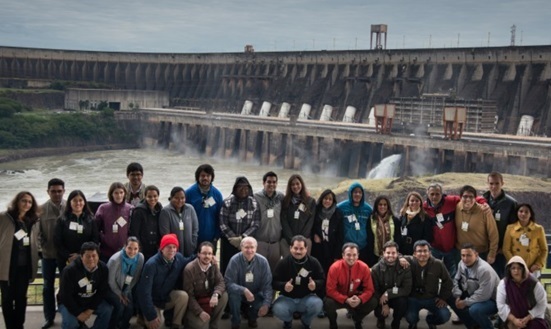 The course was organized locally by the International Hydroinformatics Center, a bi-national (Paraguay and Brazil) UNESCO category 2 center hosted by Itaipú Binacional. Approximately fifty individuals from Brazil, Argentina, Paraguay, Bolivia, Venezuela, Chile, Costa Rica, Nicaragua, Cuba, Mexico, Belize, Guatemala, Panama, Peru and the United States participated in the course. The purpose of the course was to train Latin American hydrologists on NASA, UNESCO and other flood and drought modeling and remote sensing tools. For ICIWaRM, it represented part of our broader commitment to UNESCO as Global Technical Secretariat of UNESCO-IHP’s arid regions water resources program “G-WADI”. Much of the training load was assumed by NASA’s Applied Remote Sensing Training (ARSET) program. ICIWaRM’s primary role was organizing the sessions involving the Latin America and the Caribbean Flood and Drought Monitor (LACFDM). This involved the participation of Prof. Eric Wood and Colby Fisher, of Princeton. Topics included remote sensing products for rainfall estimates, flood monitoring and inundation mapping, flood early warning, post-flood relief planning, evapotranspiration estimates, snow and ice mass balance, groundwater and soil water, and vegetation monitoring. The course was conducted as part of the UNESCO-IHP project “Water Resource management in arid and semiarid regions of Latin America and the Caribbean” (MWAR-LAC), financed by the Government of Flanders (Belgium). The Flemish Institute for Technological Research (VITO) and the International Water Security Network (IWSN) also partnered on the event.